Since this post was written, Google has implemented Search within Google+ and rendered much of the old Google Sparks writeup below obsolete. I have a new post up at our sister site WebBeat.TV on Google+ Search. Yes, it’s time for more Google+ how-tos! 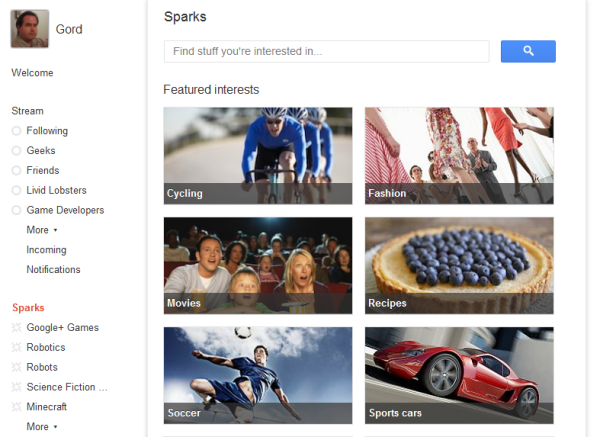 This time we’re going to have a look at Sparks, a severely under-valued part of the whole Google+ package. 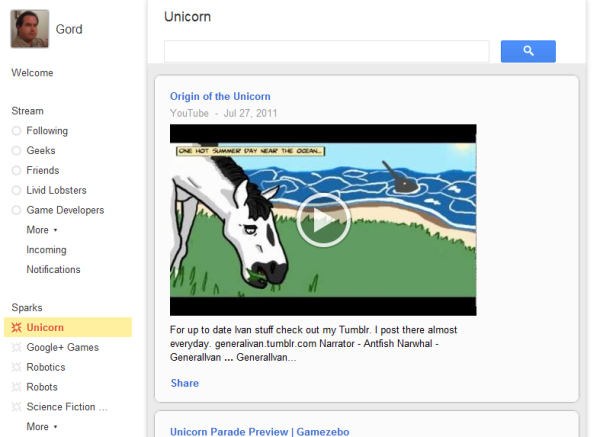 Sparks are accessed right below the Stream options on the left side of your Google+ main page. When you click the Sparks heading, you’re taken to a page that looks much like the above screen capture. To get started with Sparks, find the big text field with “Find stuff you’re interested in…” This is where you type the subject you want to see news about. For instance, say you want to see some Unicorn news. Then, click the magnifying glass icon or hit enter to search. It’ll start showing you news right away. It’ll show you more than just one story of course, and you can scroll through to see more and more. If it’s an interest you’re going to want to come back to a lot, you can “Add Interest” to pin the Spark to the list over on the left. You can see some of mine are Google+ Games, Robotics, Robots (yes, I like robots, can you tell?) etc. Once saved to your list, you can return to it again to see if it’s updated. Sparks are intended to show only the latest news about the topic, which makes them fantastic research and drill-down tools for news and for keeping up on subjects you’re really into. One last thing to note is the little Share link. Clicking that makes it easy to share the Spark just as though it were any other Share on Google+. It brings up the standard Share panel, which you should be very familiar with if you’ve read my Google+ Messaging Basics or Google+ Advanced Messaging posts. The same rules and features apply – you can share to individuals, circles, and even people who aren’t even on Google+, etc. See those posts if you want to know more. Have you been using Sparks? What are some of your favorite subjects to dig into with them? What features are you hoping Google brings to them? Let us know in the comments! Rosi, have you tried using the mobile site instead of the app? It may not be as optimized but I would think that would give you access to it. I’m really glad you guys are doing these ‘tutorials’! I hardly ever use social media on a computer — the vast majority on my iPhone or iPad. I’m quite interested in using Sparks, but I’m disappointed it’s not offered on the IOS platform yet (it seems?) because that’s how I usually use Google+. Bummer! Anyone still have Google+ invites??? Michael, Trey is awesome. I had the good fortune to make it into the Hangout he had with Cali and John last week so I got to talk to him briefly. Amazing photographer and a really good guy. I have a Photography circle set up so I can go see what people are sharing and he’s a big part of that circle. Maia, I don’t know the ins and outs of the Sparks selection algorithm. I do know that they focus in very heavily on only the very latest news about a subject. If you’ve got a popular blog you might try experimenting with it to see if you can find what they go by. I have to imagine that it’s a pretty complex system they’ve got to catch only relevant material. I just tried a spark on “Google+ Messaging” and my new messaging post from this afternoon shows up at the top of the list, so apparently it IS possible. It’s also worth noting that even though my previous two G+ messaging how-tos are not that old, they do NOT show up in the results. 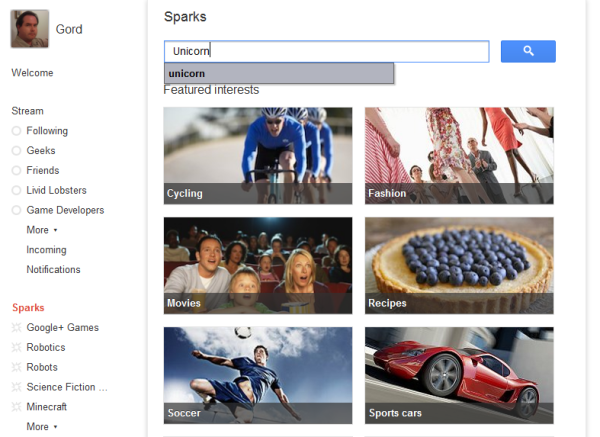 I’m also using Sparks to curate interesting content and find it very useful in that regard. 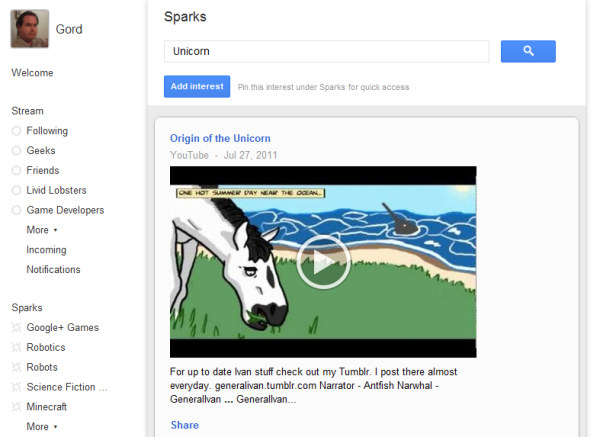 One thing I’m curious about — how does Google determine what articles go under a Sparks category? Are they mining for tags, keywords, or what? For example — I have a fairly popular blog on socially engaged Buddhism (http://jizochronicles.com), and I’ve set up my Sparks to look for articles on socially engaged Buddhism, but I never see anything from my blog there. Wondering how they find those articles… any insights? 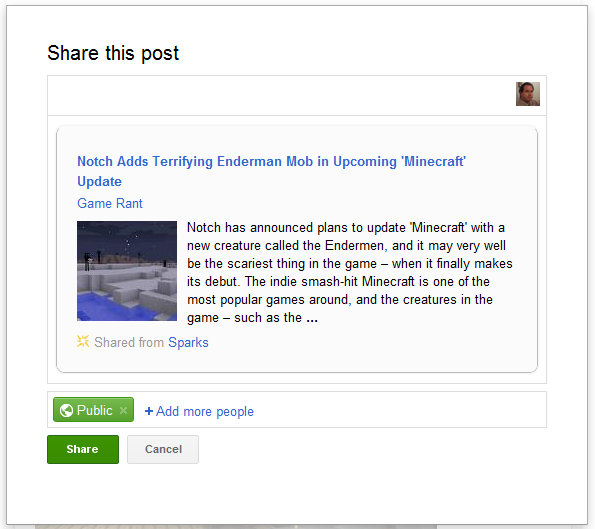 I use G+ Sparks in order to curate interesting content. This is so we are not just hearing about the latest developments within Google, nor the gif animated photos. I also look forward to hearing more about other topics than just social media which seems to be at the top of the list with shares. Hooray for Trey with his photos! ~ Along with some others I have found that just love to share a great photo. thank you for another great howto article about Google+. I’m already excited for the next one because your articles helped me out a couple of times already. After reading your article I know a bit more about Google+ and it’s possibilities. I use Google+ Sparks for news on Movies, Android, Robotics and Comics. Just some of my interests at this moment. Post your email, and I’ll send you an invite. Can someone please send me a google + invite.